Data loss prevention (DLP) is an important issue for enterprise message systems because of the extensive use of email for business critical communication that includes sensitive data. In order to enforce compliance requirements for such data, and manage its use in email, without hindering the productivity of workers, DLP features make managing sensitive data easier than ever before. For a conceptual overview of DLP, watch the following video. 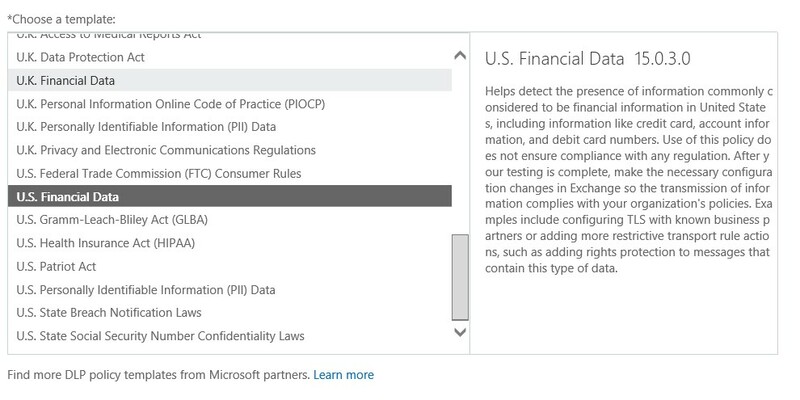 On the left side of the screen, select compliance management: Click data loss prevention, located in the middle of the tabs above your information. After selecting +, there will be 3 options to choose from. The options are detailed below, and for this example, we’ll use the “New DLP policy from template” option. The first option, “New DLP policy from template”, allows you to create a policy based upon the Acts outlined in the section below. 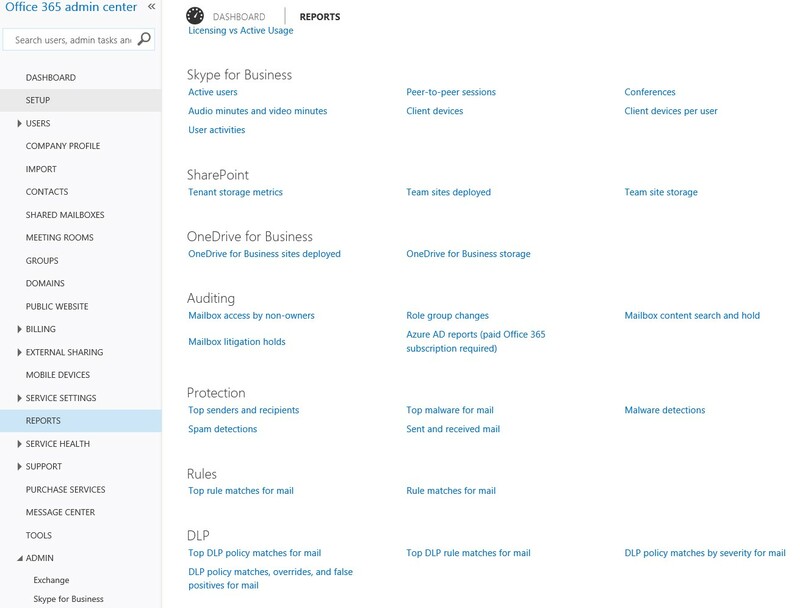 The second option, “Import DLP Policy”, allows you to use templates of Microsoft partners instead of the ones provided with Office 365. The last option, “New custom DLP Policy”, is what you’ll use to create a custom policy that suits the needs of your organization. S. Health Insurance Act (HIPAA). EnforceRules within the policy are evaluated for all messages and supported file types. 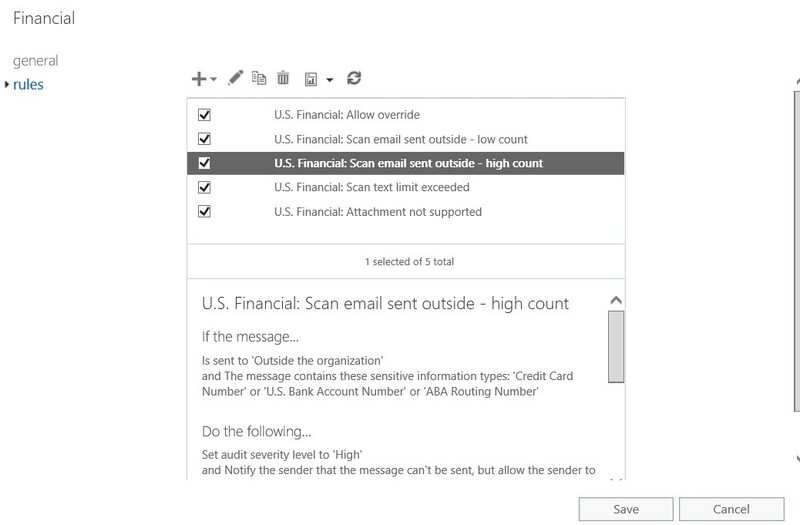 Mail flow can be disrupted if data is detected that meets the conditions of the policy. All actions described within the policy are taken. 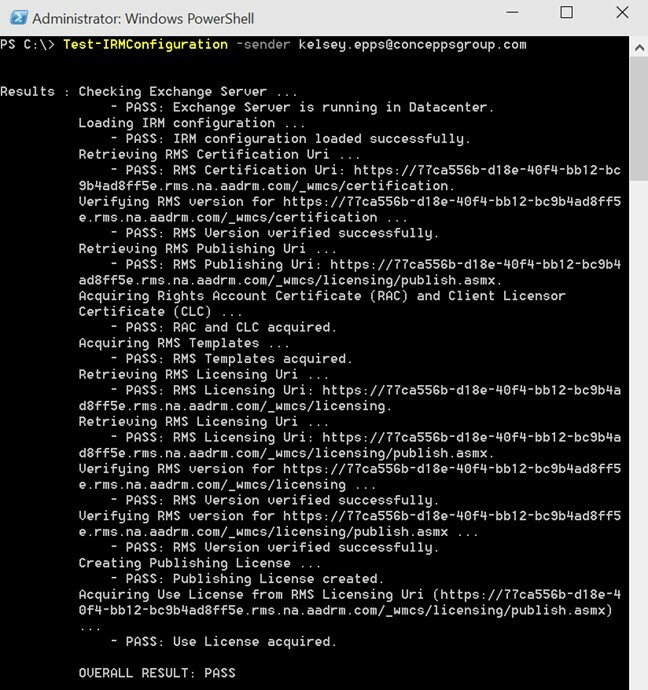 Test DLP policy with Policy TipsRules within the policy are evaluated for all messages and supported file types. Mail flow will not be disrupted if data is detected that meets the conditions of the policy. That is, messages are not blocked. If Policy Tips are configured, they are shown to users. 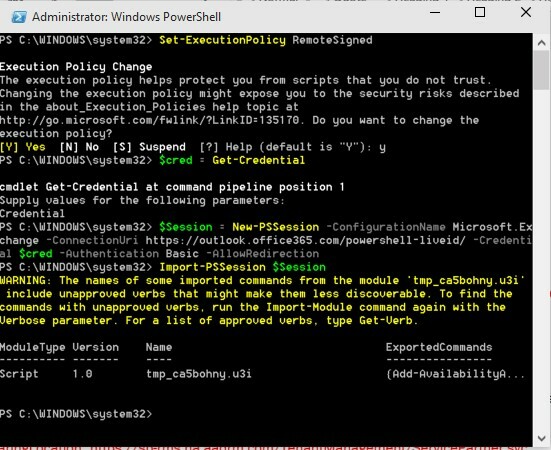 Test DLP policy without Policy Tips Rules within the policy are evaluated for all messages and supported file types. Mail flow will not be disrupted if data is detected that meets the conditions of the policy. That is, messages are not blocked. If Policy Tips are configured, they are not shown to users. Note: This enables the policy, but puts it in a detection-based mode so that you can evaluate detections to make sure this is the right policy for your organization. Double click on the DLP created and Click Rules. and Send the incident report to jrivero@UEDISON.COM, include these message properties in the report: sender, recipients, subject, severity, sender override information, matching rules, false positive reports, detected data classifications, matching content, original mail. To comply with OIG requirements, additional Transport Rules were created and associated to the DLP’s already created. Policy Tips are a way to notify your email users before they send a message about possible non-compliant information in their message. 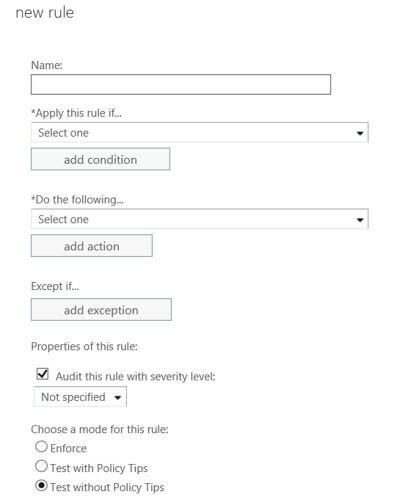 You can configure a policy tip to notify the sender, allow the sender to override, block the message, or redirect them to a compliance URL. 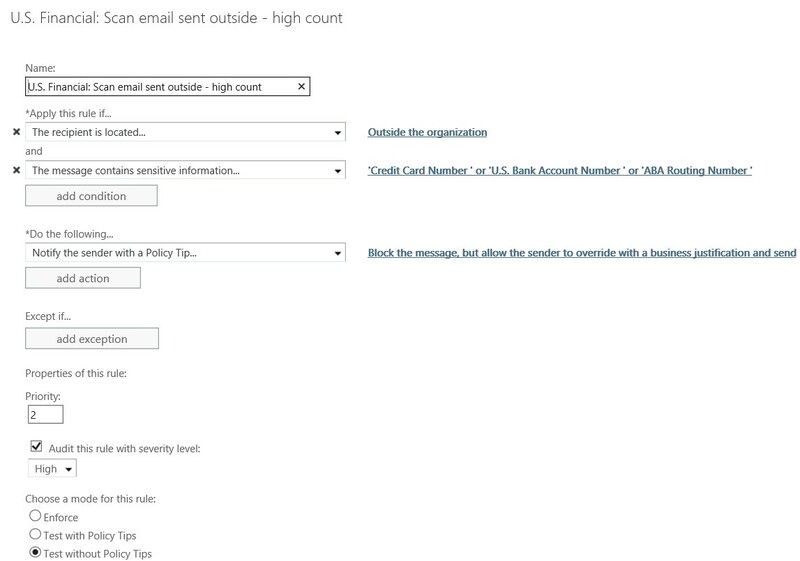 I this case we will go through how to create policy tip to block the message from sending. 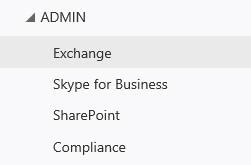 From within the same Office 365 Exchange Online section we have been working in above, go to data loss prevention again. 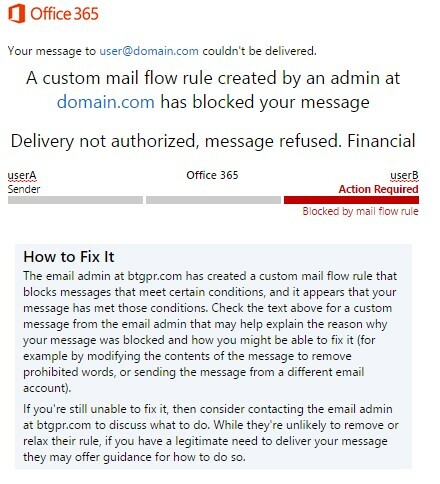 Note: Currently, DLP works only with Outlook 2013 for Policy Tips; OWA in On-premises or Office 365 cannot process DLP Policy Tips. Obviously, this is a crucial point to make. 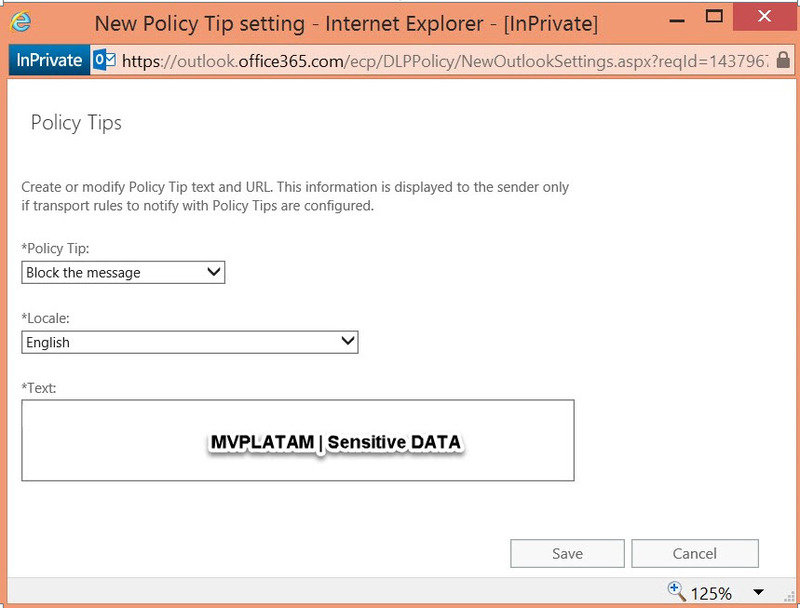 To ensure that DLP Policy Tips are available to users, make sure you have deployed Office/Outlook 2013. 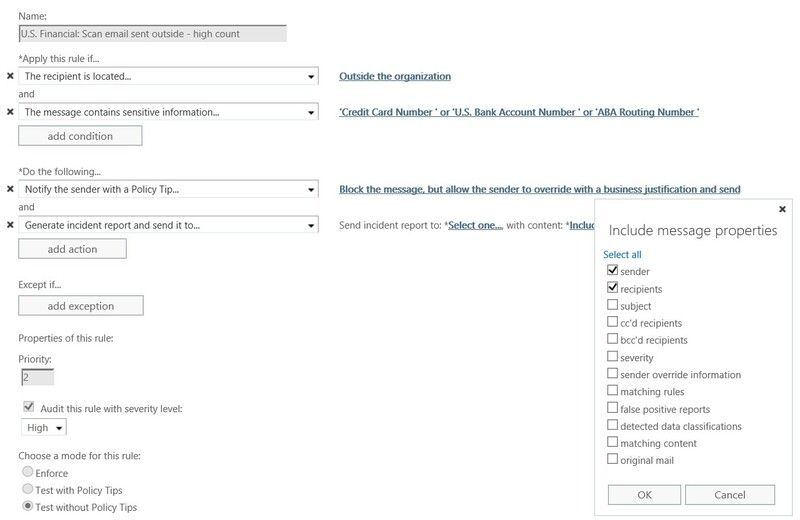 Encryption of emails can be configured with a new Transport Rule or configuring an action of encryption in a DLP rule on the “Do the following” action. It can be configured on each rule a generation of an incident report and send it to a group or persons for auditing.